you can sew or press sewn items? 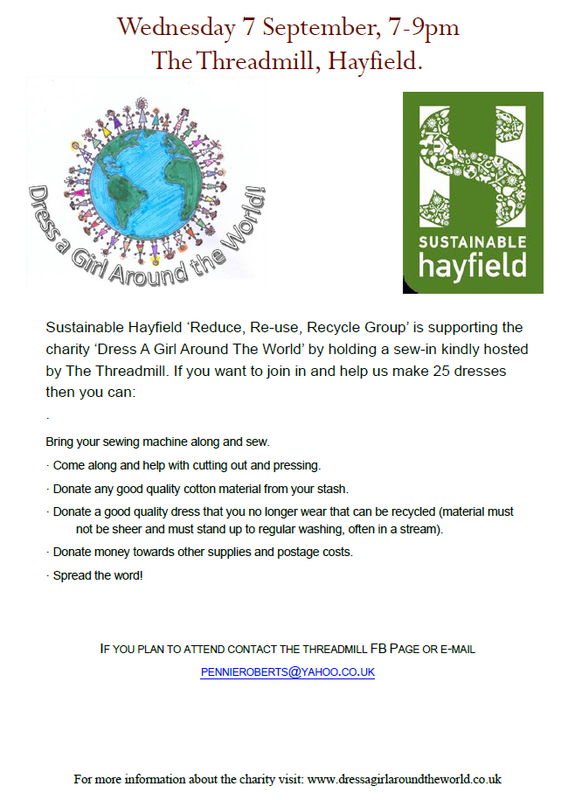 Sustainable Hayfield's newly-formed Reduce, Re-Use, Recycle sub group is joining forces with The Threadmill (based at what was Slack's Mill on Swallow House Lane) and Handmade Hayfield to make/supply some dresses for the charity Dress A Girl Around the World (see www.dressagirlaroundtheworld.co.uk) via a sewing evening to be held at The Threadmill on Wednesday September 7th 7-9.00p.m. The aim is to make 25 dresses in the evening. A flier is attached. Could you supply materials in advance? Or make a modest donation, to help buy material or assist with postage? Or come along to sew (if you've a sewing machine, even better!) or cut materials, or press finished dresses? If so, please let Pennie Roberts know, at pennieroberts@yahoo.co.uk. The charity advises that having a dress increases school attendance, lowers the risk of abuse and gives girls a sense of dignity- all absolutely vital. Thanks for your support. And I hope that you're able to enjoy these summer days......wherever you may be. Thanks to the nearly 30 people who turned up for our AGM and some brainstorming afterwards: ideas aired there will go forward to help shape what we do. And particular thanks to those attending who 'stepped forward' by indicating interest in discrete areas of our activity. 'Food' and 'recycling' were the two most commonly-expressed areas of interest and, in the wake of that evening, our food and recycling sub groups have both arranged imminent get-togethers to consider 'next steps'. If you want to know more, let me know. If your interest is biodiversity, you may wish to know our colleagues at Transition New Mills are holding another 'balsam bashing session at The Picker, on Monday 1 August 18:30 – 20:30, The Picker, New Mills. Meet at bridge between Dye House Lane and Hyde Bank Rd. In truth, you don't need to 'bash', you pull up easily. It's a good cause and it making a difference in reducing the spread of this invasive weed, which smothers almost every other plant once it's established. Wear sensible footwear and gloves. The council's contractors won't collect: anything larger than 30cm x 40cm, light bulbs, fluorescent tubes, televisions, computer monitors and laptops, fridges and freezers, washing machines, cookers and microwave ovens, glass or ceramic items e.g. slow cookers or glass kettles. If you leave them out, you'll just have to take them back in again and dispose of them via other means.